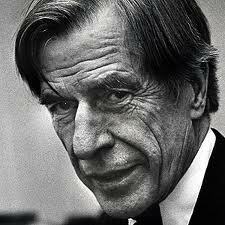 John Kenneth "Ken" Galbraith, OC was a Canadian-American economist. He was a Keynesian and an institutionalist, a leading proponent of 20th-century American liberalism and progressivism. His books on economic topics were bestsellers from the 1950s through the 1970s and he filled the role of public intellectual in this period on matters of economics. Galbraith was a prolific author who produced four dozen books and over a thousand articles on various subjects. Among his most famous works was a popular trilogy on economics, American Capitalism (1952), The Affluent Society (1958), and The New Industrial State (1967). He taught at Harvard University for many years. Galbraith was active in politics, serving in the administrations of Franklin D. Roosevelt, Harry S. Truman, John F. Kennedy and Lyndon B. Johnson; and among other roles served as United States Ambassador to India under Kennedy. He was one of the few honorees who received the Presidential Medal of Freedom twice. He received one in 1946 from President Truman and another in 2000 from President Bill Clinton. He was also awarded the Order of Canada in 1997 and, in 2001, the Padma Vibhushan, India's second highest civilian award, for his contributions to strengthening ties between India and the United States. In the world of minor lunacy, the behavior of both the utterly rational and the totally insane seems equally odd. One could indeed argue that human happiness would be as effectively advanced by inefficiency in want creation as by efficiency in production. Politics consists of choosing between the disastrous and the unpalatable.